© I Heart Food / Courtesy of Need Supply Co. 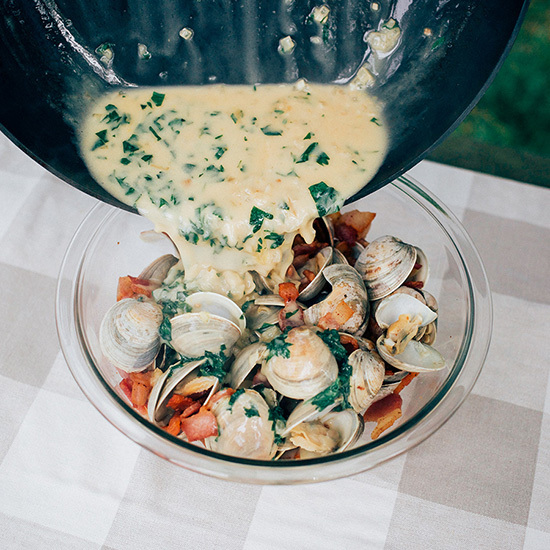 Fill a stock pot with about half an inch of wine and then place the steamer and clams in. Turn to high and cover, steam for 15 minutes. You’ll know they’re done when they open. Discard any clams still closed after steaming. You should have a couple of cups of clam stock in the bottom of the pot. Don’t throw it out! Freeze what you don’t use in the recipe for later. Tip: To cut back on salt, use a bacon or ham that isn’t as salty. Thank you to I Heart Food.